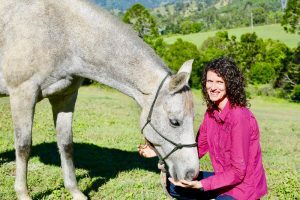 Naomi Miller has a Diploma of Animal Acupuncture and Oriental Therapies, practitioner qualifications in Equine Muscle Release Therapy (Bowen Therapy), and a Bachelor of Business. She has studied equine anatomy and biomechanics with Deb Bennett, Ph. D., and equine nutrition with Eleanor Kellon, VMD. Naomi provided acupuncture, cold laser therapy, shiatsu, and Bowen therapy in the Sunshine Coast and north Brisbane regions of Qld for 6.5 years before moving to the Adelaide Hills in late 2017. She takes a ‘whole horse’ approach to treatment, considering biomechanics, conformation, saddle fit, hoof care, and mental / emotional aspects during treatment. A keen student of horsemanship, Naomi loves applying her learning in biomechanics to her riding.